The official Uncheckit’s website claims that it can help you uncheck the unwanted software in the setup wizard. It sounds rather ridiculous, but the truth is that the application itself is classified as a potentially unwanted program (PUP). Apparently, it might install itself without user’s permission with a help of other questionable applications. If that is how it entered your system, we would advise you to delete the software as quick as you can. You can erase Uncheckit via Control Panel, and if you slide below the text you will find removal instructions too, What’s more, our research revealed that the PUP might also connect to the Internet without your consent and drop malware or other unreliable programs on your system. Thus, we do not recommend leaving the software installed. Even though the PUP is supposed to be a clone of an application called Unchecky, you should not mistake these two programs. Unchecky is a legitimate application that actually does what it promises. As we said earlier, Uncheckit is a PUP that only appears to be a program, which can automatically uncheck unwanted suggestions in the setup wizard. The software is signed by Evangel Technology (HK) Limited, which could be a fictitious company. Our researchers believe that it might have been developed by Elex-tech or one of its partners. In any case, there is no doubt that the PUP was released by an unreliable company, and you should not trust it. We also learned that the application could settle on your system without your knowledge. For instance, Uncheckit could be installed by browser hijackers known as Yessearches.com and Hohosearch.com. Perhaps, you noticed them on your browser? These browser hijackers might change your homepage, search engine or new tab page. Using Yessearches.com or Hohosearch.com is a bad idea because they might show you modified search results and lead you to unreliable web pages. Therefore, these search engines might be potentially harmful to your computer. If you are going to remove the PUP from your computer, you should also make sure that a browser hijacker who installed it in the first place will also be eliminated. It could be that the application was developed to reinstall the browser hijackers it came with or drop malware on user’s computer. The PUP has all necessary means to download and install malicious software without asking your permission. Firstly, Uncheckit can auto start with the Windows operating system, so it can launch itself against your wishes. Lastly, the PUP may connect to the Internet without your permission too. It seems to us that the program is untrustworthy, and you should not allow it to act on its own. The best you can do is to delete the application from your system before something bad happens. If you want a program that unchecks unwanted software in the installation wizard, you should look for legitimate variants. Sadly, Uncheckit could work in a different way, and it might be not good for your system. If you do not want to take any chances with this program, you can erase it from your computer with the recommended removal steps located at the bottom of this page. 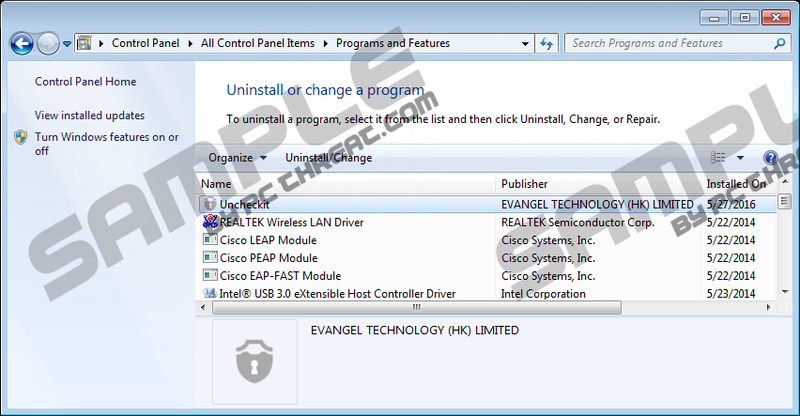 It will explain to you how to access Control Panel with your current Windows version and how to uninstall the application with it. If you have one of the browser hijackers mentioned above, you should also get rid of them. You could look for removal instructions on our website or install an antimalware tool and delete them automatically. In fact, you can eliminate this PUP the same way too. What you have to do is install a reliable security tool, launch it and start a system scan. Once, the scanning process is completed, you will receive a report with detections of all threats that could be on your computer. Then you should click the button that will appear after the scan, and the antimalware tool will erase these threats. Launch the RUN by pressing Win+R. Locate Uncheckit, mark it and press Uninstall. Select the PUP and click Uninstall. Quick & tested solution for Uncheckit removal.